We have had two very interesting meetings in the past months. At our October meeting we had two guest speakers, Diane Looker and Pam Timmins from ‘Geelong Coast Days for Girls’ which is part of a world wide group. They offer a feminine hygiene programme providing quality, sustainable solutions for girls who have nothing suitable to manage their periods. Kits are made and distributed to help give dignity, health, education and safety to the girls who receive them, including so far in Nepal, East Timor, The Solomon Islands, New Guinea, Uganda, Cambodia, Malawi and Zam bia. Several of our members have become involved and are doing a great job. The display for October was Brooches and they ranged from beautiful to quirky! In November we met at All Saints Hall for our Christmas lunch which was a shared plate affair and proved a hit for variety and taste. Speaker was our own Denise Bell, enthusiastic Lace maker who visited Slovenia this year for the 17th World Lace Congress of OIDFA — the International organization for bobbin and needle lace held in Ljubljana. She also attended some of the classes offered as part of the congress. Idrija and Pag are two areas that have their own styles of lace making. 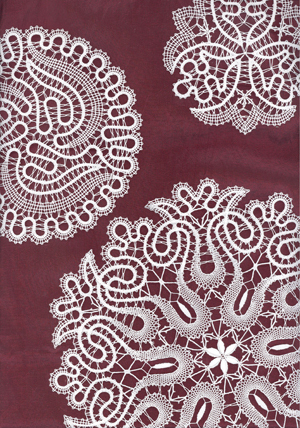 Lace is so important in Slovenia that stamps were issued to mark the occasion. Our December meeting at St Davids on Monday 12th is our AGM and you are all welcome to join in and also view the Intermediate Certificate Canvas Work Display. Classes for next year will be available for signing up so don’t miss out. This entry was posted in Meetings and tagged Days for Girls, Lace, Slovenian Lace, Speakers by EGV Geelong Admin. Bookmark the permalink.